While presenting, annotation can play a large role in how you interact with your audience. In PowerPoint, you can use the Pen tool that can change your static slide into a whiteboard upon which you can annotate, simply by doodling or writing! In this tutorial, we will learn how to use Pen tool in PowerPoint 2016 for Mac. Learn how to use the pen and highlighter tools within slide show view in PowerPoint 2016 for Mac. Michelle Maislen sits on the bleeding edge of Mixed Reality Technology, with a goal of democratizing 3D creativity in Office productivity workflows. With over a decade of product experience, Michelle is an expert and advocate for delightful customer experiences and sees Augmented/Virtual reality as the future for computing. Jeremy Kersey has always been at the intersection of art and technology, bridging the gap and bringing together the multiple disciplines found in software and game development. His passion for computer graphics, real-time rendering and technology has led him through a wide variety of interesting and challenging projects throughout his career. In this conversation, Michelle and Jeremy talk about the new 3D Content Guidelines for Microsoft. 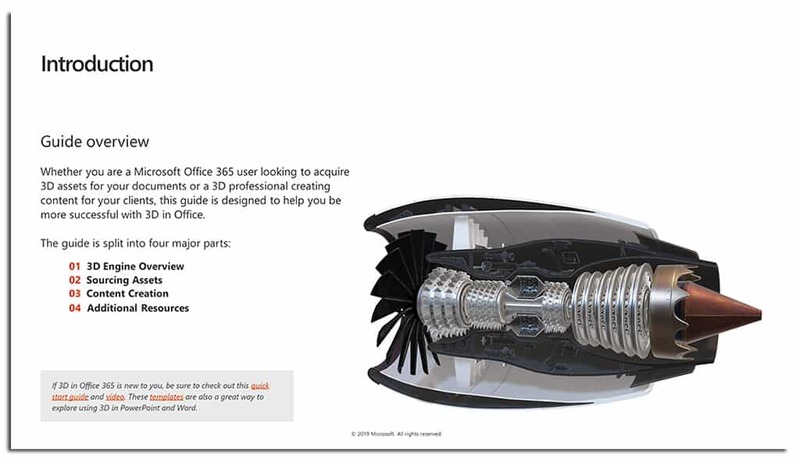 Geetesh: PowerPoint and Office have some amazing 3D capabilities, and Microsoft just released 3D content guidelines. Can you tell us more about the need for these guidelines, and how users can access them? A large International law firm expressed a desire to hire external freelance artists to develop 3D content for litigation graphics presentations but didn’t know what development guidelines to provide the artist, to ensure that the models rendered and performed as expected in PowerPoint. A full-service design studio stated that they tinkered with creating 3D assets in-house but wasted a lot of time trying to figure out how to get the models to look the way they wanted once in PowerPoint. They even mentioned that they gave up on a project for a large Automotive client because they couldn’t get 3D assets to work in PowerPoint in the way they needed. A PowerPoint presentation design firm shared that they had to turn down business from a large Industrial client, because their 3D assets were in a format that Office doesn’t currently support (Collada .ZAE), and didn’t know how to optimize, or convert the 3D models into a format that Office supports (.GLB). A Global Corporate Consulting firm stated that they are willing to invest money on 3D content but need assurance that the assets they develop will work reliably in Office. All this feedback helped us to recognize that there was a clear opportunity to provide guidance to Enterprise customers on best practices for buying, custom building or converting existing 3D content that is optimized for Office. Enterprise customers have 3D needs that Office cannot satisfy with our own 3D content, so as a result, a number of teams within Office came together to create the 3D Content Guidelines for Microsoft, which helps our customers build or optimize their own custom assets, to unlock 3D usage across organizations. Jeremy: As Michelle mentioned, The Presentation Summit was really the moment the need for the guidelines became super clear and helped us define the basis of what content should be included. Throughout the development of the guidelines the continued customer connections helped us validate what we had created so far and pushed us to increase the scope of the guidelines to cover the recurring questions and workflow issues we were seeing. Geetesh: How do you suggest users benefit from the guidelines? Do you have any recommendations for PowerPoint users? 3D Engine Overview: Learn about the inner workings of the real-time 3D engine used in Office and how it compares to other methods of rendering 3D content. Sourcing Assets: Tips and tricks for finding quality 3D content in online marketplaces and working with vendors to build your custom assets. Content Creation: Step through the process of creating content for real-time rendering in Office. From modelling, surfacing and animation through to optimizing and exporting your assets. Additional Resources: Discover tools for viewing, analyzing and validating your 3D content as well as links to other valuable resources. Use some Morph transitions when showing models from multiple angles. They work so well with 3D content and the added production value usually grabs people’s attention. Both preset and embedded animations are a great way to make presentations come alive. There are studies that indicate comprehension and retention can be improved with 3D, consider how it will help communicate the idea or tell a better story. Don’t over do it! As with any shiny new feature the temptation is always high to use it everywhere. Have fun with it and experiment. We have already seen users create some very cool presentations with surprising uses of 3D. Emma Bannister is passionate about presenting big, bold and beautiful ideas. She is the founder and CEO of Presentation Studio, APAC’s largest presentation communication agency, and author of the book, Visual Thinking: How to transform the way you think, communicate and influence with presentations. Emma is a highly sought-after speaker, influencer and globally recognised presentation expert, and was recently awarded MVP (Most Valuable Professional) status from Microsoft. In this conversation, Emma discusses her work at Presentation Studio, and the presentation design scene in Australia. When you are working with one or two presentations in PowerPoint, you can easily access slides within any of them, compare presentations and edit content. And it is also easy to copy or move slides from one presentation to another. However, the situation may not be the same always. Let’s imagine you have four presentations open, and presently you can only see the one that is active. What about the other three presentations? How do you navigate to those presentations without having to close or minimize the active presentation? In this tutorial, you will learn how to switch between multiple open presentations in PowerPoint 2016 for Mac, which is different from how you do so in PowerPoint for Windows. Learn how to switch views between multiple presentations in PowerPoint 2016 for Mac. Judd Albrecht has always been a creative person, from when he was young all the way up until now. Some ways he satisfies that need to be creative are animating, creating graphics, writing/playing music and playing with his kids. He went to school and graduated with a degree in 3D animation. Along with a background in animation, he developed many more skills that have made him a well-rounded digital artist. The thing he loves most about being an artist at PresenterMedia is being able to create content that will help people better express their message and help bring their presentations visually to life. In this conversation, Judd talks about PresenterMedia, and Roundy, their new animated character. Geetesh: In changing times, PresenterMedia’s content is always relevant, contemporary, and evolving. How do you achieve this miracle? Tell us more. Judd: Our first and foremost motivator at PresenterMedia will always be our customers. They are the reason we do what we do. Their success in presentation creation is what drives us to always be relevant and always keep evolving in what we create. Whether it’s new content or innovative new features, we are always looking for ways that help cut down the time it takes for our customers to create great presentation material. Geetesh: Can you tell us more about Roundy, and what motivated you to create this character? Judd: Now on to Roundy the round character. Before a polygon on Roundy’s head was ever created, there was behind the scenes content meetings with my fellow amazing artists. We had been enjoying making new content with our line of more realistic human characters but thought it was time for a new character to be unveiled. We thought our customers would really enjoy a very simplistic character that has great facial expressions. So, I said I would take the task of designing such a character. There were some things that inspired me as I began the character development process. The first inspiration hit while watching a kid’s TV show called Story bots with my two boys. I saw how expressive and simple the characters on that show were and decided to start going that direction. My goal was not to come up with a character that was a groundbreaking never been seen before design, but a character inspired by many awesome character designs which I would draw inspiration from. The ending result was the character, Roundy. I hope our customers will really enjoy using Roundy in their presentation material, as we enjoy making more content using this wonderful new character.